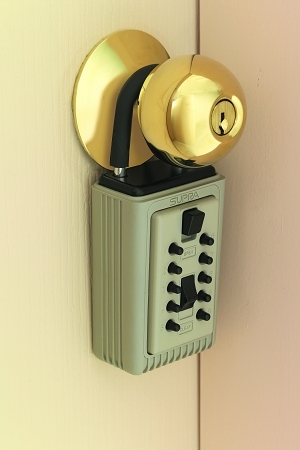 This durable, portable key lock box is constructed using thick rustproof, zinc alloy metal walls with an interlocking faceplate for a high degree of security and has been used by real estate agents for years. The Portable Key Safe lock box features a heavy duty mechanical keypad -- which needs no batteries -- that opens easily using a numeric combination you choose and set yourself providing secure access to your keys. For added security, the pushbutton combination is easily changed as often as you wish . The raised keypad design permits opening the unit even in near-dark conditions, unlike dial combination types. The portable Key Safe spare key holder, which has a rubberized coating to help protect surfaces, holds 3 standard size keys and mounts instantly to doorknobs, railings, water pipes or any object you can fit the shackle around. Save when you buy 6 or more, $26.50 ea. Add a protective cover: keeps the faceplate clean if exposed to mud or severe weather. Flexible black rubber (shown below) fits snugly but allows easy access $6.95.